I can’t believe the end of 2016/17 Bundesliga season is already here! It’s gone by in a flash, but what a wild ride it’s been thanks in no small part to the fun I’ve had playing Official Fantasy Bundesliga. Where do you rank in the Fantasy Bundesliga standings after MD33? Click here to find out! Having chosen Pierre-Emerick Aubameyang over Robert Lewandowski as captain, I was kicking myself a little last weekend. 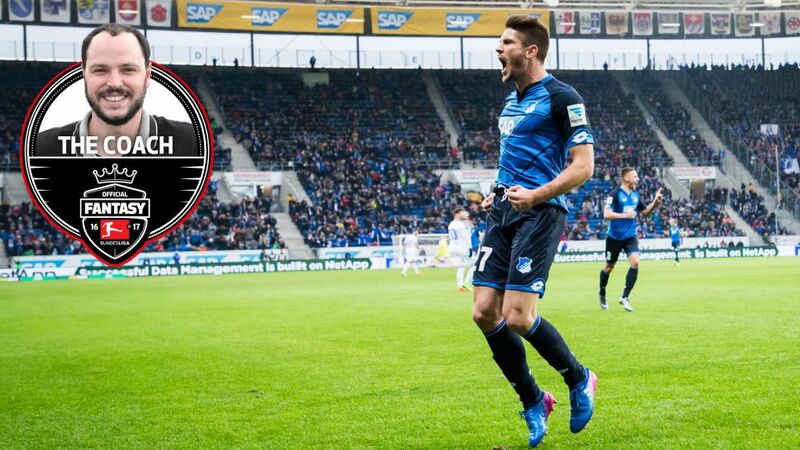 I was also gutted to see Sead Kolasinac’s “winner” against Hamburg chalked off! Still, I didn’t have the worst weekend, even if I didn’t hit triple figures. However, I’m aiming to finish on an even higher note on Matchday 34, and I’ve got three highly motivated strikers, from three different fixtures, in mind to help me do just that! Getting an automatic berth into the Champions League group stage would make a world of difference for Hoffenheim. Level on points with Dortmund heading into the final day, the Sinsheim side are going to need to score big to cut the goal difference deficit. They got five last time out against Werder, and I reckon a similar goal-haul could follow this weekend. Click here for an overview of the final-day fixtures!